Twelve million people carry Cryptosporidium. Did one of them just swim in your pool? Is This Disease-Causing Germ in Your Pool? Twelve million people carry Cryptosporidium. Did one of them just swim in your pool? Cryptosporidium – Crypto for short – is a disease-causing germ that may well be in your pool. According to the Centers for Disease Control and Prevention (CDC), Crypto outbreaks linked to swimming have doubled since 2014. Just what is it, and how can you make sure your pool is safe? Cryptosporidium is a parasite that can survive up to 10 days, even in properly treated pools. Crypto causes diarrhea, and otherwise healthy individuals can carry Crypto unaware. Children, even those wearing swim diapers, can spread the parasite. The primary way of becoming infected is by swallowing contaminated water. Even a mouthful of Crypto-infected water is enough to cause illness with symptoms including diarrhea, cramps, nausea, and vomiting, which can last for weeks. Even healthy people are susceptible to Crypto, but very young children or those with compromised immune systems can be especially vulnerable. Since even a small amount of contaminated water can cause illness, it is important to thoroughly treat pool water to avoid Crypto contamination. 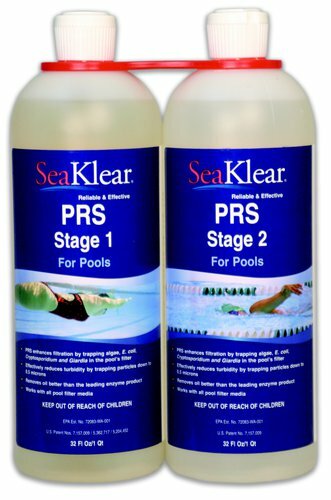 The SeaKlear PRS is a two-stage treatment that improves pool filtering to remove particles as small as .05 microns. SeaKlear protects your family and guests not only from Crypto, but also other harmful germs such as E.coli and Giardia. SeaKlear is easy to use and provides the extra insurance that your pool is clean and safe. Get the protection you need and the peace of mind that comes from knowing your pool is safe from harmful disease-causing germs. US1 Pools offers a wide range of cost-effective water care products to treat just about any dirty water issue. Our focus is on taking the bad stuff out of your pool, so your family can swim happy.